Goldman Sachs Group Inc. is making a case for "peak coal" in a research note Sept. 22, offering that global thermal coal production and demand reached a high water mark in 2013 and will only decline in the future. "Peak coal is coming sooner than expected," Goldman said. 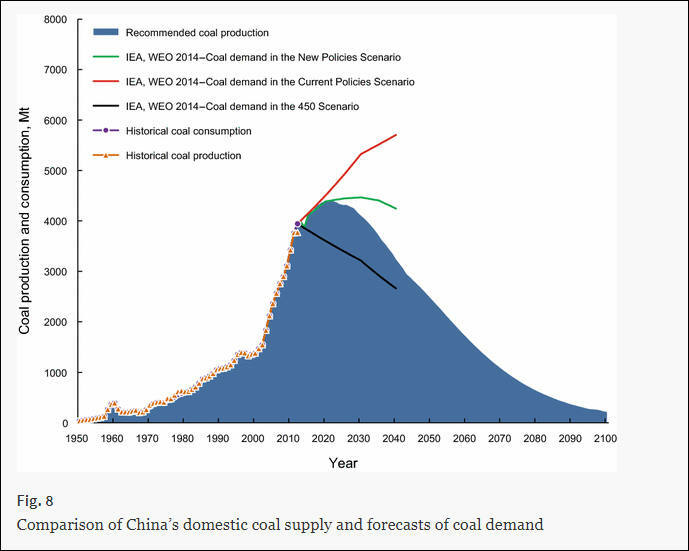 According to its latest model, Goldman predicts worldwide demand for thermal coal used in power production will decline from a high of 6.15 billion tonnes in 2013 to 5.98 billion tonnes at the end of its forecast range in 2019. 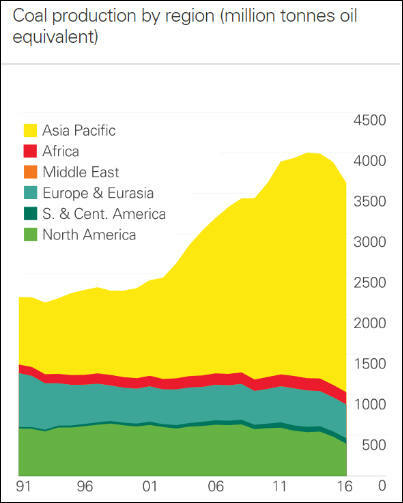 Total global production is also expected to peak in 2013 at 6.20 billion tonnes and decline to 5.99 billion tonnes in 2019. 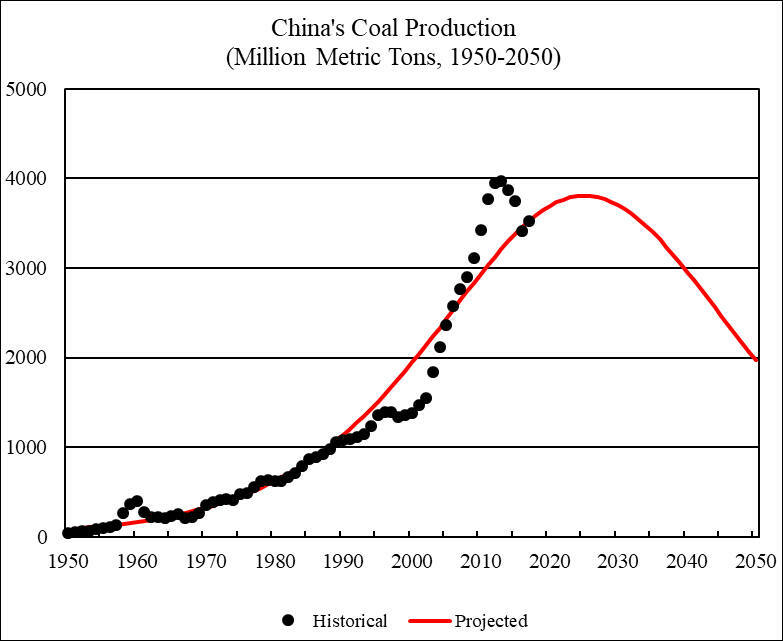 China coal mining also do not rise, debt situation is very bad. China produced 263.75 million tonnes of coal in May, sliding 15.5% year on year, data from the National Bureau of Statistic (NBS) showed on June 13. That dipped 1.6% on month, compared with the decline of 8.77% in April, data showed. China’s raw coal output stood at 1.34 billion tonnes over January-May, dropping 8.4% from the year prior, compared with the decline of 6.8% in January-April. Does it mean what Chinese cheap product won't be so cheap? Yes, and in long term it can even mean that it won't be any Chinese products for export. 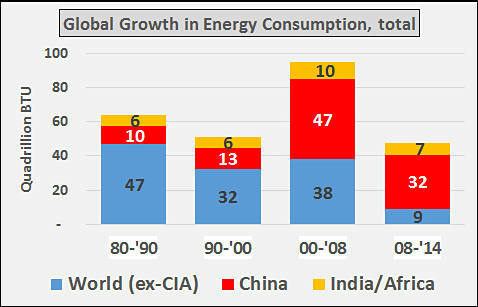 China important 1,557 billion tons of coal, 12.4% more comparing to one year ago. And thing become much worse - August year to year rise is 52,1%. 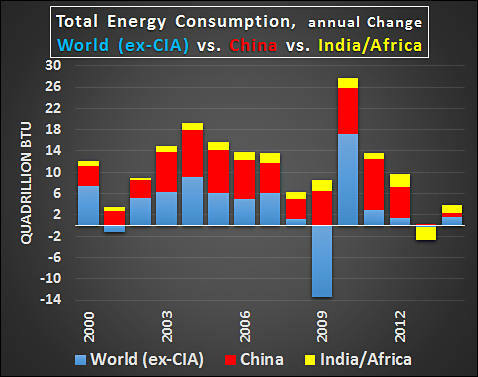 All imports is caused by collapsing domestic coal production - by nine month reduction was 10,2%. And it goes with acceleration, in August it reached maximum - 11%. 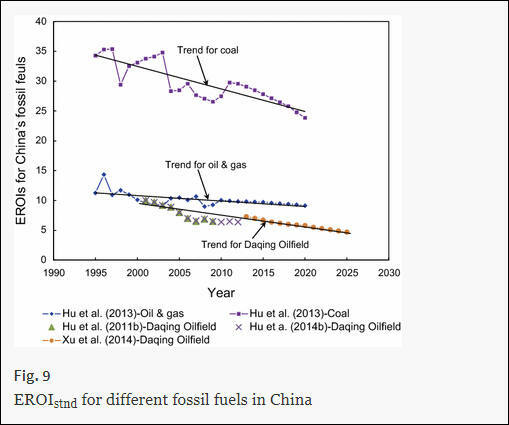 China is also eating up coal deposits they had, they reduced by another 12.2%. China's daily crude oil production in October fell to the lowest in more than seven years, statistics bureau data showed on Monday, as producers remain reluctant to drill new wells amid tepid oil prices and as output drops from aging wells. The country's National Energy Administration is suspending 85 planned or in-progress coal power plants -- not because they're threats to the environment and public health (which they are), but because they don't fit in with China's latest Five Year Plan. 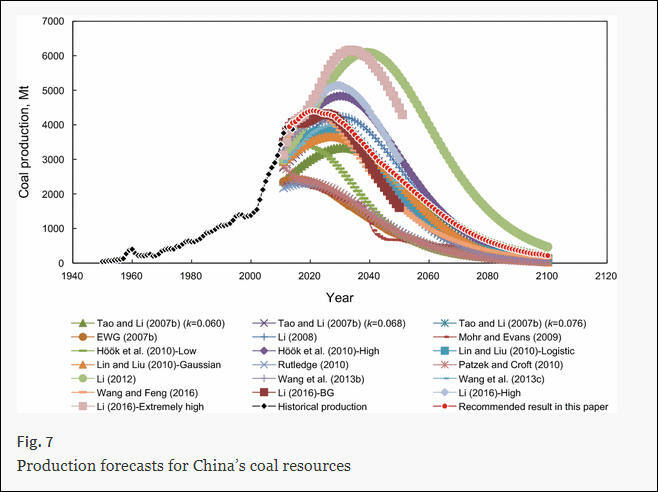 It's targeting a coal capacity limit of 1,100GW, but the plants would have brought it to 1,250GW. And now they tell us that they care for people health, they don't, just peak coal passed. From what I read (including your article at the top) it's demand for coal that has peaked, not supply. Production has decreased in China because there was a general economic slowdown from previous over-stimulation. 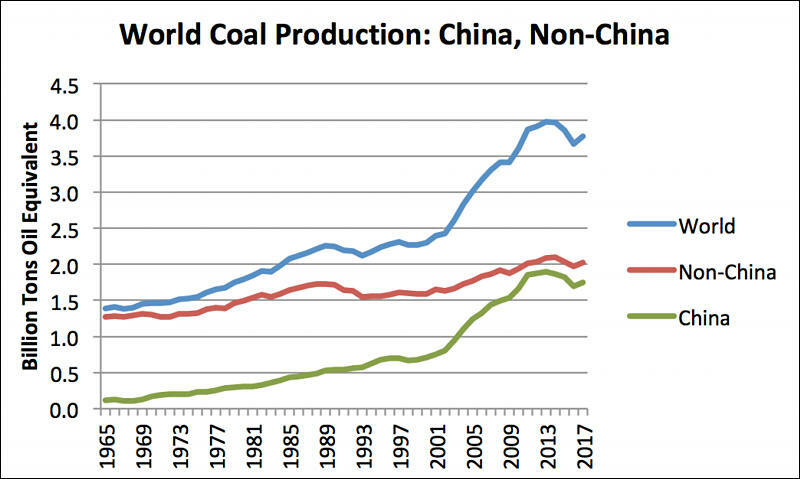 For example, in the previous years, Chinese firms used a lot of coal to make a lot of steel at a loss, now it's sitting waiting to be used and the steel plants are running at lower capacity. With Beijing having more and more days of unbreathable air each year, the Chinese government is under some pressure to reduce pollution. Also, China seeks to bolster their geopolitical image and they aren't going to do it on human rights, so they're working on environment. 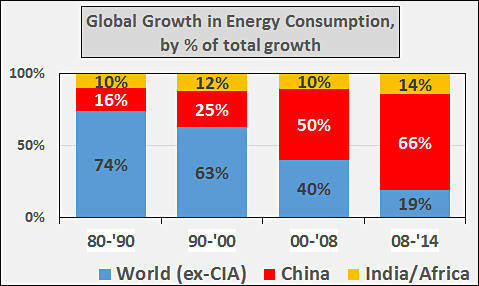 PRC has a lot of self-made problems to address in the next few years, but a lack of energy isn't one of them. From what I read (including your article at the top) it's demand for coal that has peaked, not supply. Well, even simple view on debt (curve is present in charts above) and money invested is enough to understand that it is wrong view. Coal and oil production always start from big, easy to mine areas. They are depleted now. In such situations you see both attempts to push new money via almost free debt into sector and still fall of production (due to natural limits). You can check present Brazil on where it all leads. Your curve charts show the cost of servicing debt, not cost of extraction. 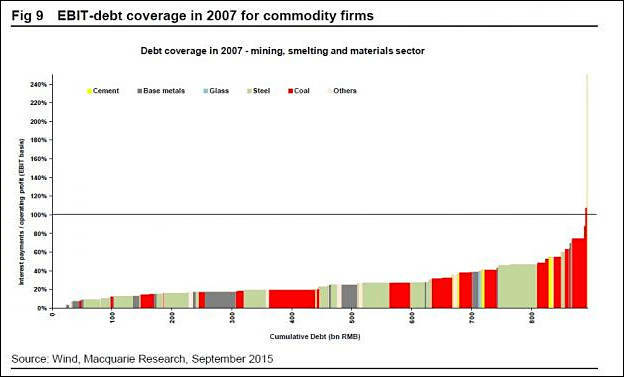 Between 2007 and 2014 mining companies took on a lot more debt to stay in operation while resource prices were low due to global economic meltdown. They are loaded down with debt but not because their costs to extract have risen. Instead, it's due to rapidly lowering demand and built up stockpiles that depress the price. In fact, the extraction price may have actually gone down due to new technology. 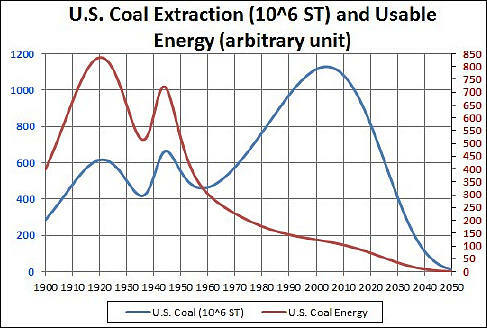 In the US, coal extraction dropped 10.3% in 2015 but coal consumption dropped 13.1% and as a result US stockpiles of coal rose 20.6% to 238.8 million short tons or 3.5 months-worth of current US consumption. Employment at US coal mines dropped 12.0% during this period indicating that productivity increased during that time. At the 2015 consumption rate of 798 million short tons, the US estimated recoverable reserves (the amount that could be mined using only present technology) of 255.8 billion short tons would last 320 years. In the US at least, coal production is at its lowest levels since 1986, but is still outstripping consumption and leading to the highest year-end stockpiles ever recorded. If you are not on the debt market , loss or not does not count, as it was financed from government. Was it right? Of course, at tactical level. Your curve charts show the cost of servicing debt, not cost of extraction. 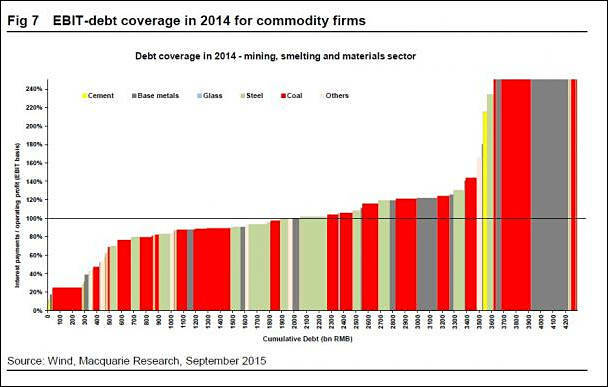 Between 2007 and 2014 mining companies took on a lot more debt to stay in operation while resource prices were low due to global economic meltdown. They are loaded down with debt but not because their costs to extract have risen. Instead, it's due to rapidly lowering demand and built up stockpiles that depress the price. 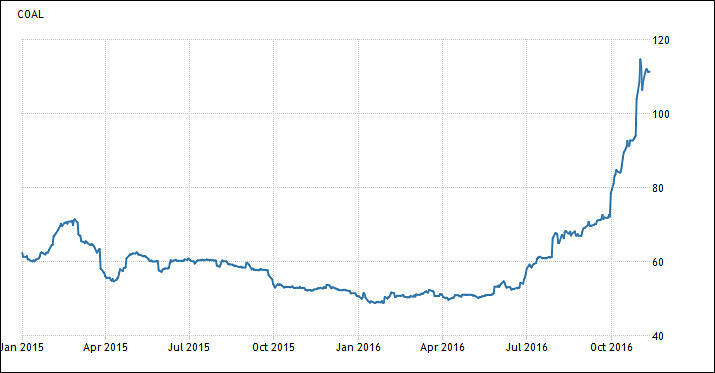 I mean curve on recent charts :-) Or you can just go and look for Chinese internal debt issue. Us mining companies, Chinese mining companies or who? From where arise "rapidly lowering demand", what are fundamental reasons? 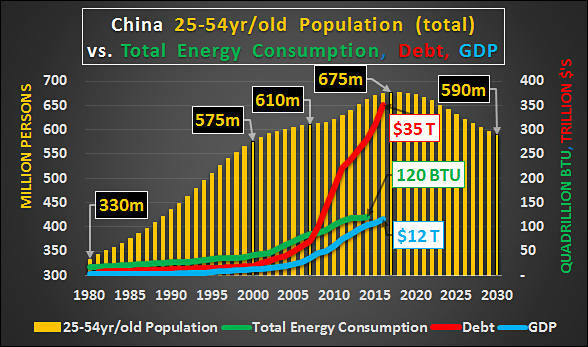 If you just look down at consumption charts in US and China you will see difference. 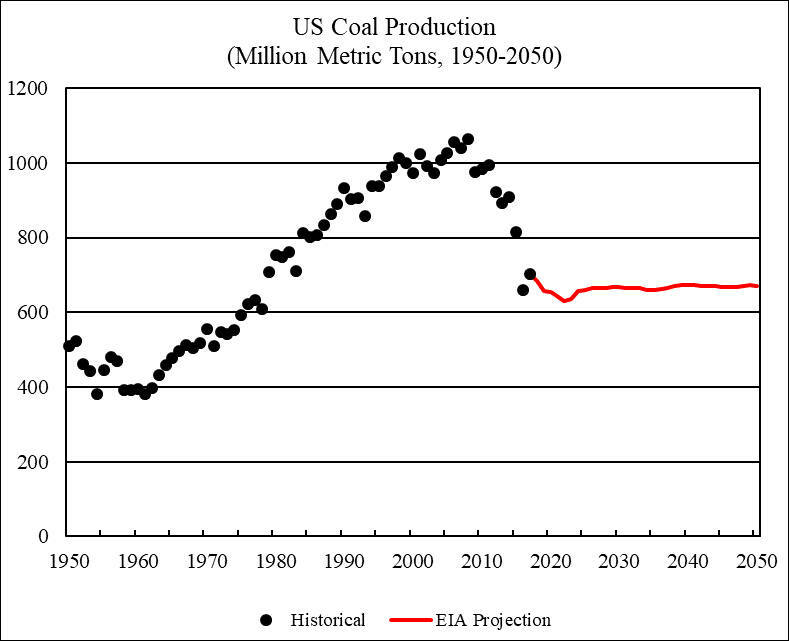 US present and temporary coal issue arise from this http://www.personal-view.com/talks/discussion/15618/us-issues-with-shale-oil-and-gas-in-charts#Item_2 . Yet nature laws are still inevitable. I mention debt because the first two charts you posted were about debt - and they look so terrible because debt shot up in that period not because of rising costs to extract coal. 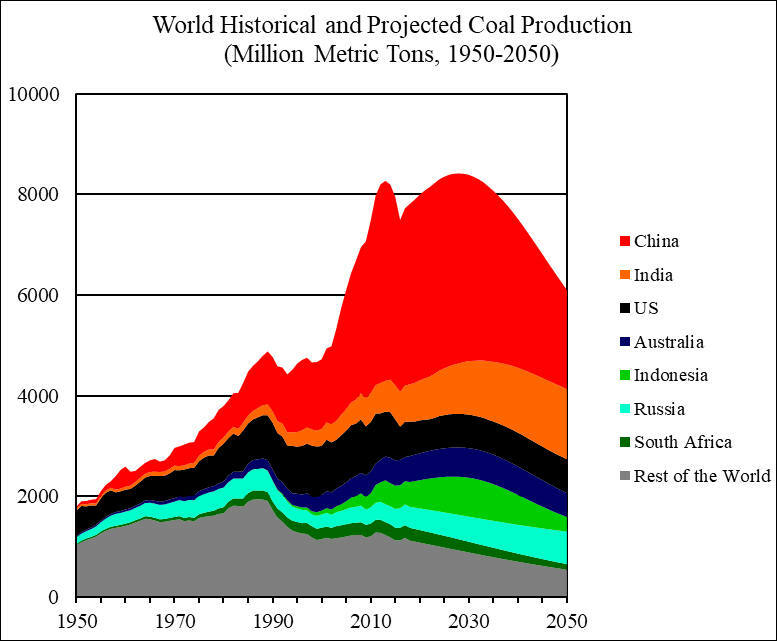 Where does the lowering demand for coal come from? I believe it is: 1) lower cost petroleum, 2) low cost of steel and other products requiring coal for production due to high stockpiles, 3) environmental regulations/restrictions on coal burning for energy. I don't think we're reading the shale oil and gas charts the same. To me they show a pretty regular pattern of new wells peaking within a year or so but then generating a fairly predictable tail pattern. Output was higher in 2011-14 most likely due to more wells being drilled while oil prices were quite high. With lower prices in 2015-16, fewer new wells were drilled--companies couldn't afford it in the US where most need >$45/barrel to break even. 2017-18 will probably look more like 2011-12 if the price of oil continues to increase. My point here is, "Peak coal" refers to a peak in the demand for coal, not the supply. 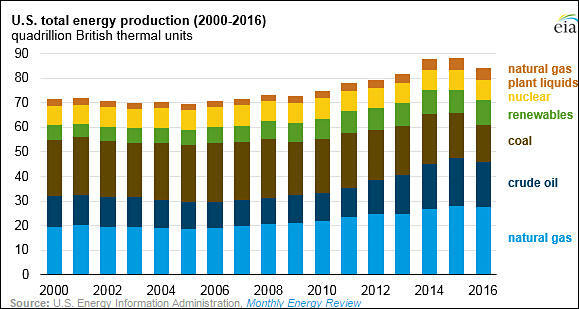 U.S. fossil fuel production fell 7% from 2015 to 2016. Most of this decline was from coal production, which decreased 18% and fell to its lowest level since 1978. Relatively low natural gas prices, especially in the first half of 2016, and relatively flat electricity demand contributed to the decline in coal production. Petroleum and natural gas production also declined, falling 5% and 2%, respectively, as prices for both fuels were below their respective 2015 levels. After declining slightly in 2015, U.S. renewable energy production increased 7% in 2016. Wind energy made up almost half the increase in renewable production, while solar energy accounted for nearly a quarter. Both fuels saw substantial electricity generating capacity additions in 2015 and 2016. China is stepping up its push into clean power with a revised renewable energy target. The nation is now aiming for renewables to account for at least 35 percent of energy consumption by 2030, whereas its previous target only stipulated "non-fossil fuels" making up 20 percent of energy use within the same time frame. The new plan, called the Renewable Portfolio Standard, aims to tackle the country's soaring pollution levels by reducing its reliance on coal. Poor journalist do not understand that you can reach 35% not only rising renewable energy, but by dropping other energy consumption, and this is that is happening fast. And consequences follow. This is only small part, more going on during this year.